The finished garland is elegant enough to hang in your home, while still being cheap and simple enough to make for school Halloween party decorations. It would also be a great addition to the decor at a Halloween wedding. For larger cobwebs, look for commercial size coffee filters (restaurant supply stores usually carry them fairly cheaply). 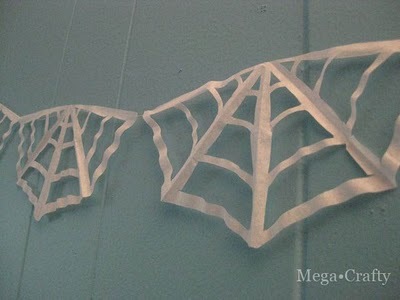 For miniature cobwebs, try using white cupcake liners instead. SO fun! Love coffee, love Halloween! so perfect for a kids project…i’m going to try this very soon with my grandson :D and i’d love to share this link with everyone on my blog! thank you so much for sharing and i’ll go check out Meg at MegaSpooky! Awesome idea for decorating on the cheap!